Do you need quick cash in under 30 minutes? 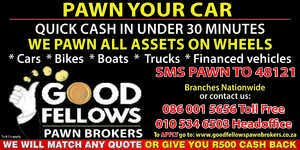 Good fellows pawn brokers are the guys for you​! We offer a 30 day contract that are renewable monthly with an option to extend as many times as you would like too. We loan money against all assets incl. Vehicles, Trucks, Bikes, Trailers, Boats, Heavy duty machinery and Plant Equipment. Our professional team of evaluators have over 50 years of experience in the motor industry which guarantees you the best possible offer on your asset. With our customised deals, we can assure you that we can find the best solution to your situation as quick as possible.